but in a slightly more compact super-MOI putter favoured by some of the top Tour Pros. Even the very best putters on Tour are looking for forgiveness on anything struck slightly wide of the sweet spot. have minimum impact on ball speed to ensure the ball gets up to the hole, giving you a chance. We’re probably going to recommend that most of our golfers look at the Spider Tour Platinum. This model has a sight line to help with aim and alignment. 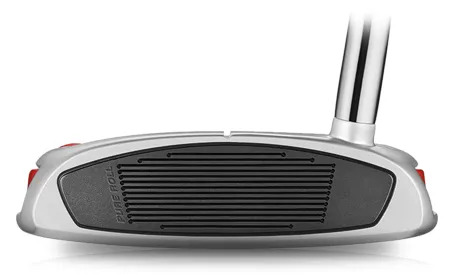 The insert on the face of the Spider Tour putters features grooves that will flex. That helps to impart top-spin onto the ball, and therefore a better, truer roll, with less skidding and bouncing. Another feature the Tour Professionals enjoy with the Spider Tour Red and Black, along with the very clean appearance at address, is the half shaft off-set. Along with the absence of sight lines, both these models also have a slightly thinner grip than the Platinum. We think you’ll notice the improvements in accuracy and distance control the TaylorMade Spider Tour range delivers. We also think you’ll notice a much better roll on your putts. 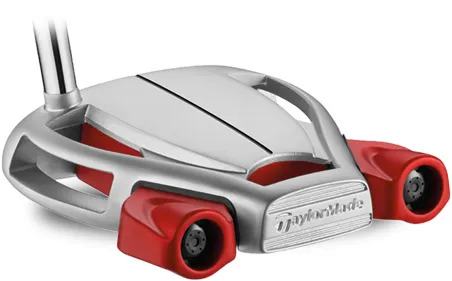 Come and try a TaylorMade Spider Tour Putter and, if that difference translates into better performance for you, let us fit you perfectly to ensure square contact down the target line more often.